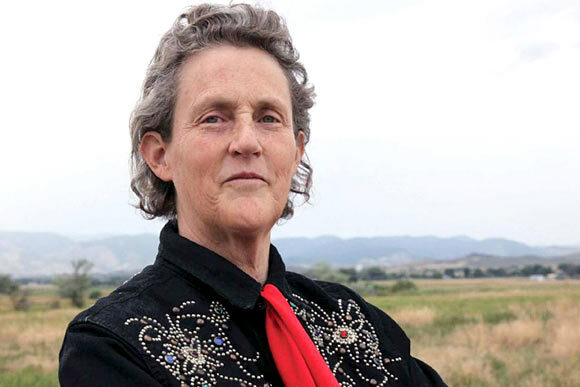 Temple Grandin (born Mary Temple Grandin) is an American autism activist and spokesperson, doctor of animal science, bestselling author and inventor of the “squeeze box”. She was born in Boston, Massachusetts in 1947 and diagnosed with autism at a very early age. Grandin had a speech developmental disorder and could hardly speak at all until the age of four. One of her doctors recommended speech therapy so her mother hired a nanny who played word games with Grandin and her sister all day long. From an early age, Grandin says she is lucky to have had sympathetic and encouraging teachers. However, she recalls that high school was very difficult for her because of her inability to interact with her fellow students in the same way that everyone else did. She often felt shy and out of place, particularly as many students taunted her because of her limited conversational skills. This did not hamper her pursuit for education however, as she went on to obtain a bachelor’s degree in psychology from Franklin Pierce College (1970), a master’s degree in animal science from Arizona State University (1975), and a doctoral degree in animal science from the University of Illinois (1989). She first started speaking publicly about autism in the 1980s after meeting Dr. Ruth Sullivan at an ASA (Autism Society of America) meeting. Dr. Sullivan is a pioneer in the field of autism and one of the founders of ASA. She noticed Grandin in the crowd and approached her about speaking at next year’s conference, to which Grandin agreed. Her speech at the next ASA meeting was a huge success as she gave a firsthand description of her experience as an autistic individual and answered numerous parents’ queries regarding the behavior of their children. In subsequent speeches, Grandin has described her hypersensitivity to stimuli such as noise and also how her cognitive process is more visual than verbal. She supports early intervention to help manage the behavior of children diagnosed with autism. Temple Grandin also gained prominence after being featured in Oliver Sacks’ book titled “An Anthropologist on Mars” published in 1995. The title is derived from Grandin’s own description of how she sometimes felt, especially around people she could not relate to. At the age of 18, Grandin invented a device known as a “hug machine” (sometimes also called a squeeze box) for calming down hypersensitive people, usually those with autistic disorders. Her machine originally met with some criticism but she received encouragement from her science teacher and continued to develop it. Several studies and detailed analysis have been conducted on its usefulness and favorable results have been published in scientific and psychological journals. Grandin no longer uses her own device since it broke, as she feels she has progressed enough to not need it anymore, although she still uses anti-depressants regularly. Another field of interest for Grandin is animal welfare. She is an advocate of humane livestock practices and improvement of standards in slaughter houses. She has written various essays and papers on the subject in which she argues that animals may be human “property” but they have rights under the law and must be treated in a compassionate manner. For her efforts in this field, she has won a “Proggy” award from PETA (People for the Ethical Treatment of Animals). She also serves as a consultant to the livestock industry regarding animal treatment and behavior, and is a professor at Colorado State University. She has been the subject of a partly biographical film titled “Temple Grandin” which was nominated for and won major awards including an EMMY. Other honors include honorary degrees from prominent universities such as Carnegie Mellon, a Double Helix Medal for her support of autism awareness and research and induction into the “Times 100” list of most influential people in the category of “Heroes”.